Q. 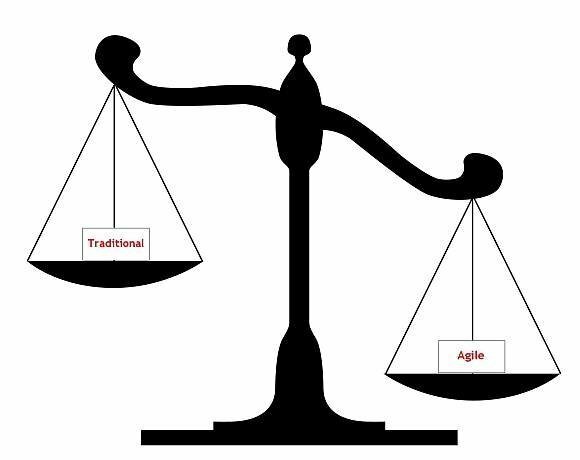 How is Agile development different from traditional models? All requirements are known and specified. • All roles are assigned, specific to project phase or stage. • The stages of the project, and their time-frames, are defined. • The end product is expected to match the original specifications. The most common traditional software developments models are the Waterfall model and the V-Model. These are sequential, and in a sense, monolithic. In the former, the project goes from one stage to the next such that progress is made at each stage towards the end result. While the V-Model is similar, the post-coding stages make use of the knowledge and experience gained during pre-coding. Problems with such approaches arise when all requirements cannot be known; when one stage of work might change the scope of another; when information must be exchanged between groups working on different stages; and so on. In software development, these broad issues are, more often than not, the norm. With agile development, processes and productivity are optimized by tackling the project in a series of small steps. Each step in the series results in a functional piece of work. The work is reviewed, requirements are re-assessed, the overall direction of the project is realigned, if necessary, and work continues into the next step.